One of the reasons to visit Toronto almost two months was food – food in restaurants, food in cafe eateries, food at takeout vans, and also food in Chinese supermarkets. 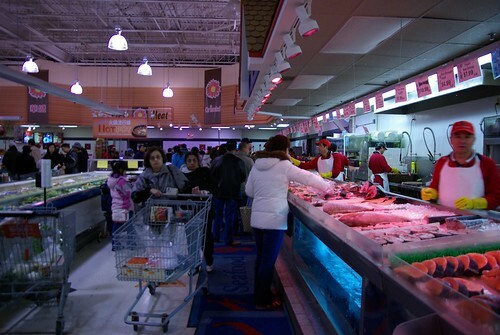 This is when I discovered Oriental Food Mart, with a few branches around the GTA, including one in Markham, where lives Toronto’s most important concentration of ethnic Chinese and another in Missisauga’s Chinese town. 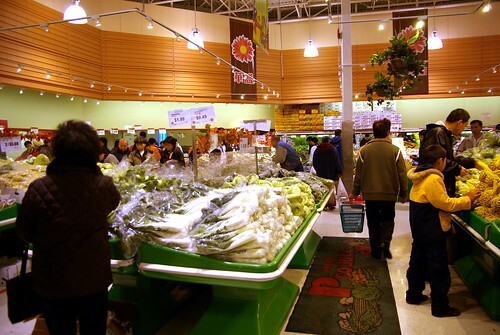 One of the advantages of any other Canadian city, including Toronto, Vancouver and Calgary is the presence of a T&T Supermarket, commonly known as 大統華 (Tai Tung Hua), a joint venture between one of Taiwan’s ten biggest conglomerates (they also sell dairy products, and even own hotels!) and Californian supermarket chain Tawa. 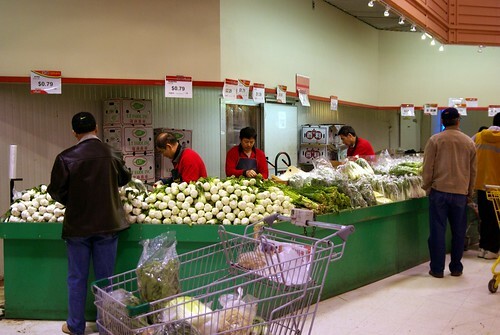 T&T is one of the best known names in the Canadian Asian grocery business and definitely rivals mainstream big names in terms of quality (Kim Phat and Hawaï in Greater Montreal are trying hard to match this level of quality but still aren”t there). T&T also has the reputation of being well-packaged and fresh, but also charging a premium for the augmented quality (qualitatively verified by yours truly). This is where Oriental Food Mart (華盛 – Hua Sheng, which translates to something like Chinese blooming) comes in, with a reputation for more competitive prices with just a slightly less appealing presentation, although not remarkably less by so much. I went on Sunday after lunch, presumably the most busy time of the week, as the suburbanites stock up for the rest of the week. My Torontonian hosts had just taken me to a dim sum place in the same new-looking mall. I did my groceries there, even if the prices were comparable – more frequently than not, it was more expensive – than in Montreal. 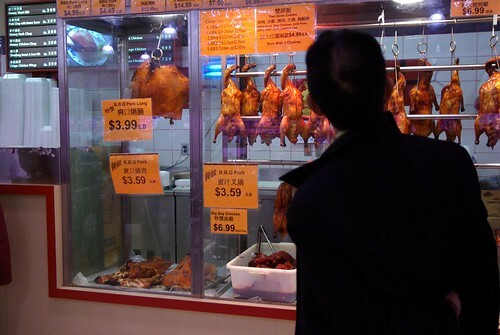 Quite naturally, you find a counter for prepared foods, a bakery and a counter of what I call Chinese cold cuts, but which is better named as siu lap or siu mei (barbecued meat). Just like anything coming from a supermarket which can be bought in a specialized shop, one may be right to be suspicious and purchase it elsewhere (which I did). Because of greater turnover and the hopeful corollary of a fresher roast, siu mei is one of those things that’s worth buying on a last day in Toronto. Oriental Food Mart is where my hosts shop most of the time. If you are planning a food trip to Toronto and have already seen and been to T&T, then the Oriental Food Mart is definitely worth going to as well. I filled any space left in my single sports bag and several cloth bags. Re. 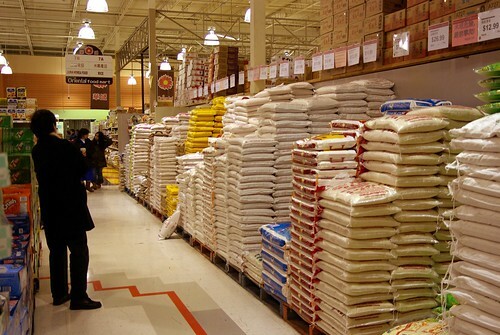 Your review of Chinese Grocery Stores in GTA. Firstly, I must say the manners of most storekeepers in Toronto are worst. They are rude, impatient, arrogent…..not only they are not helpful, you simply can’t ask them any question. These facts especially true for workers at Oriental Food Mart (Alton Towers). They need to learn how to deal with public, their old habit or mentalty will not work outside of their Chinese society. I shop at Oriental Food Mart every week, their prices are fair and the quality of meat, produce, and seafood is comparable to T&T. T&T is just too expensive. 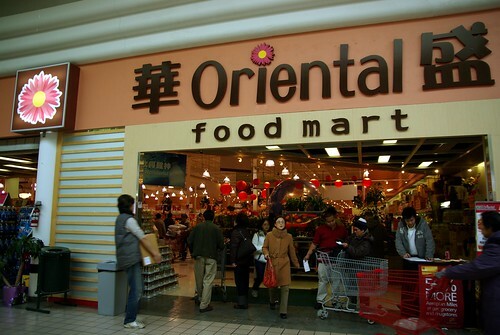 Hi, I would like to know that if the boss of Oriental Food Mart would like to open another one in Canada. I’ve found a few locations are placed for lease. This locations are in Ottawa Only. The first location would be on Carling Ave in front of the Carling-wood Mall the location would be on Mervivale Rd beside Toys r Us and Future Shop and another that’s also on Merivale Rd near Costco. The location beside Costco is 18 acres. And remeber all These locations are only located in Ottawa Ontario. I’ve no idea, Chie… But if someone knows and wants to post here, I’ll approve their comment. Well, I have something which I don’t like when shopping at most (if not all) Chinese grocery stores. 2- the same goes with meat; why do they stick 2 hugh pieces of 80lb grade paper before they put it to the scale? Rip off; people need to speak up. I have stopped buying meat and lobsters / crabs from Chinese grocery stores. 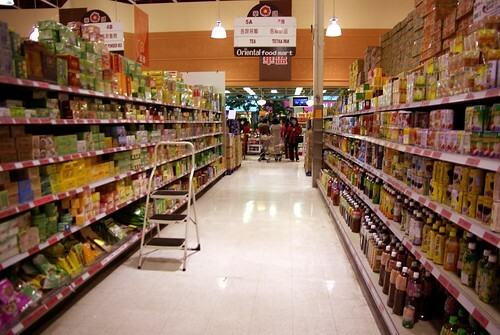 HUa Sheng isn’t classified as a food supermarket so some cashback cards MBNA Smart Cash doesn’t get the 3% on groceries. Hopefully they change their Mastercard code to reflect this so that we can all have fun there again. Actually J Renolds I have been to Oriental Mart many times and only had a few rude employees. Of course I do not talk to them often, but I find them mostly polite. Unfortunately I had a bad experience today with one of them. I guess the employee was mistaking me for another person because the lady that was doing the demo was very rude to me. When I went to get a demo she pulled it away and gave it to someone else and gave it to me last. She was also pointing and laughing at me and talking to another customer in Chinese. It turned out that she was laughing at me because I was not Chinese and I was shopping at the store. The other customer looked embarrassed by her behavior. She later commented that she said she thought it was funny for a white person to shop at an Asian store. There was another demo lady who was rude, and a cashier who refused to take quarters. Otherwise they are polite. The guy who gathers the carts is pretty polite, says hi whenever he sees me, and the people in the hot food and cake area are nice.